Fiddler Country US né Calvin Scott Stoneman, le 4 Août 1932 à Galax (Virginie), Scotty Stoneman a été membre de la fameuse "Stoneman Family", spécialisé dans un Old Time teinté de Blue Grass. Il est décédé le 4 Mars 1973. Scotty Stoneman has been called the Jimi Hendrix of the violin by Peter Rowan, and the "bluegrass Charlie Parker" by no less a figure than Jerry Garcia. Yet he's an elusive, mysterious figure -- in some ways even more so than Parker or Hendrix ever were -- with a career that was mostly spent working in tandem with other musicians, but without the kind of unified body of recordings left behind by, say, Hugh Farr of the Sons of the Pioneers (who was, himself, once compared to Fritz Kreisler by Leopold Stokowski). Until he was past 30, Stoneman was best known as part of a performing family who were, in their own right, legends in the field of country music. The Stonemans, or the Stoneman Family, started in music with Ernest Van "Pop" Stoneman (1893-1968), a man who pioneered what is now known as country music before it even existed as an identifiable category of music. The son of a lay preacher and a singer, he came from a family with a rich musical life, a multi-instrumentalist who was seemingly good on every instrument he touched. Ironically, he gravitated toward the autoharp, an instrument that he couldn't afford, and so he'd built his own from pieces of an old piano. He'd worked as a farm hand, a carpenter, and a sweeper at a cotton mill, but as always throughout his life, his main interest was music. That made the union in marriage between him and Hattie Frost, the daughter of a luthier, fiddler, and banjo player, who played the banjo and fiddle herself, seem as much preordained as natural. They had 23 children, of whom 13 lived to become adults, and it was from their ranks that the six performing members of the Stonemans came. Pop Stoneman had made his first recording privately in 1914, and his commercial recording career started a decade later with "The Sinking of the Titanic," which he'd written himself -- it sold over a million copies by some estimates, and some 200 songs followed from him over the next five years -- and from 1927 he was signed to Victor Records, then one of the largest recording concerns in the world. He brought his wife and other family members in his recording sessions, and from 1930 onward their children as well. 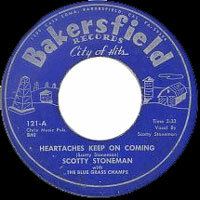 This coincided with very hard times for the family, as the onset of the Great Depression destroyed the much of the market for country music; the family relocated to the Washington, D.C., area in 1932, and Scotty Stoneman was born that year, one of the couple's last four children of their 23. They kept playing music, trained by Pop and Hattie, but most of the family's income came from the jobs that Pop held outside of music. Matters seemed to turn around in 1947 when the Stoneman Family, as they were called then, won a talent contest at Constitution Hall, the prize from which included six months' worth of appearances on local television. It wasn't quite the boon that this exposure would have meant a decade or two later, as precious few people (and virtually no country music fans) had television sets, but it gave them something to build on. A photograph of the Stoneman Family from the period shows Scotty in his early teens, fiddle in hand, one of 12 performing siblings (with two younger ones sitting atop the truck behind them). Scotty joined the United States Air Force in 1951 and served four years, during which his work with the family group was severely limited if not entirely halted. It was soon after his discharge, while in Washington, D.C., that he discovered guitarist/singer Jimmy Case singing at a club. He approached him about his work and the two ended up putting together a group consisting of Case and two of Scotty's siblings and a cousin by marriage, called the Bluegrass Champs, who passed an audition and got a steady gig almost immediately -- and wouldn't you have known that the club owner who hired them also proved to have some important television connections, most especially to host/impressario Arthur Godfrey. The Bluegrass Champs, with Porter Church added to the lineup and a few other shifts in personnel, won a contest on Arthur Godfrey's Talent Scouts in 1956. There's a great picture of the group from that period, with Scotty in the line, the tallest of them. This time out, the television exposure made Scotty and company's careers suddenly take off like a rocket, and they were soon working with the likes of Patsy Cline, Grandpa Jones, and Roy Clark, and got multiple regular radio gigs. By the early '60s, they'd made their way west and were based in California, where they recorded for World Pacific, which was the home of some of the new, young bluegrass players and also soon to be the launching pad for the national folk-rock boom. 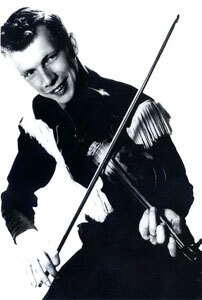 By the mid-'60s, he was a five-time national fiddle champion, playing with a technique that astounded musicians who were seemingly his peers. He played with the Kentucky Colonels, one of that new generation of bluegrass outfits that was getting noticed amid the folk revival and the early folk-rock boom. 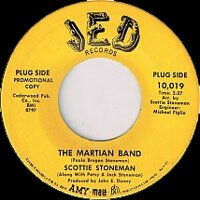 By many estimates, Stoneman's career and musicianship peaked at around that same time. For reasons that psychologists could probably explain, Stoneman's private life was conducted as fiercely as the seeming abandon with which he performed on-stage. Whether it was alcohol abuse or other problems, it worsened as he reached the second half of his thirties, and his health gradually deteriorated over the final years of his life. He was playing in a group with his wife, Mary Madison Stoneman, which also included a very young Marty Stuart, during the early '70s, but by then it was clear that his work wasn't what it had been. Stoneman died in 1973 at the age of 40.